Wind power is a clean and environmentally friendly technology that catches or extracts the kinetic energy in the wind and converts it to other useful forms of energy, for example, mechanical work to pump water or grind corn, or electrical energy to power our homes. 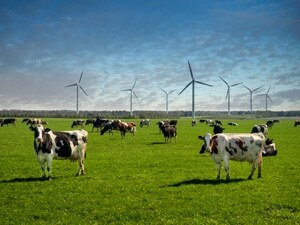 Compared to other more traditional forms of energy sources, the environmental impact of wind power on our planet, either local, regional or global, can be viewed as being minor, since being a renewable energy source, wind power does not pollute the atmosphere or consume any fossil fuels when operating because no fuel is burned. Nor does it consume clean water for cooling or leave any hazardous waste behind that could potentially harm the environment. Although wind turbines produce clean energy and omit virtually zero emissions during their operation, like many other industrial activities, wind energy may cause visual and sound impacts on the environment as well as a danger of collisions to birds and bats from the blades of these towering structures. The wind is a clean, free and inexhaustible resource being nothing more than the air in motion. Since this air has a mass, as it moves it stores large amounts of kinetic energy. Then the wind has a lot of power and a wind turbines blades can turn this power into mechanical work or electricity power. The energy content of the wind increases with height but how large this increase will obviously depend on the type of the terrain. Flat lands or mountainous areas. Clearly then, the higher the turbines tower the faster the wind speed over the blades which also allows for longer blades and faster tip speeds, increasing efficiency. However, the footprint required for a single wind turbine and the additional spacing required between wind turbines can be large increasing the land usage and visual impact of the wind farm. Construction – The component parts of wind turbines, the tower, nacelle, hub, blades, etc, need to be manufactured and the raw materials used during their construction such as steel, aluminium, copper cable, glass fibre, etc all needs to be sourced, processed and transported to the manufacturing facility adding to the environmental footprint of the turbine. Transportation and On-site Installation – As well as transportation of the raw materials, once built, wind turbines need to be transported using large lorries and trucks along the road network, possibly over some distance, to the site for installation. Construction of access roads and/or bridges for these heavy loads through fields and local countryside to the point of installation is generally required. Large concrete foundations and trenches for grid connection cables can create its own environmental issues. The work of on-site erection and assembling requires large cranes and a team of people with vans burning fossil fuels adding to the environmental footprint. Operation – Once erected and working, periodic maintenance of the turbines, including inspection, lubrication and gearbox oil change, repairs, and cleaning is required plus the transportation of these maintenance materials and crews, usually by van or truck. Also the recycling and disposing of used parts and lubricants could affect the environment if not done correctly. Dismantling After Service – Nothing lasts forever, so once the wind turbine has reached its end-of-service life, the work of dismantling the wind turbine and the transportation, again by lorries and trucks from the wind farm site to the final disposal site adds to the overall environmental impact of the wind turbine. The direct physical impact of wind power on the environment mainly consists of the concrete foundations, access road and electrical cables to the grid, as well as the turbine itself, which will require a certain amount of air space around its blades, the biggest concern for most people with regards to wind power and the environment is the visual impact. Wind turbines are man-made vertical steel structures with large rotating blades, and therefore visually have an impact on the local landscape, just like most other structures, large buildings, factories, power grid pylons, main roads, etc. Since wind turbines are tall and have rotating blades, they have the potential of attracting people’s attention. Thus turbines are perceived to have a relatively large impact on both the landscape and distant horizon. The number and size of wind turbines and their positioning plays an important role in how the public view turbines and wind farms. If the wind turbines are positioned and spread out along a line, the land requirement could be very small but they appear to spread along the horizon. If they are arranged together in groups or in a matrix the land requirement may increase becoming dominant points on the landscape. Then in order to maintain public acceptance, the siting of wind turbines and wind farms need to be designed in such a way as to minimise the various visual and amenity impacts when viewed from both short and long distances allowing over time for wind farms to be better accepted. To some people, wind farms enhance the beauty of the area. Also, the perception that these large areas of turbines use up valuable farmland can sometimes be farther from the truth. While the turbines themselves may cover a large area of farmland, most of the land they stand on can be used as before, as arable or even pasture land as only the small areas on which the turbine foundations stand is unavailable for use. Offshore wind farms located in the seas and estuary’s are too far away from houses and buildings to be affected by the noise generated by the rotating turbines. Nowadays, most modern vertical wind turbine designs have improved significantly to the point where any mechanically generated noises from the operation of the gearbox, generator and other moving parts has been virtually eliminated through the use of good design and insulating materials in the nacelle. Then the issue of noise emissions is one of aerodynamic noise and vibrations from the rotating blades. The aerodynamic noise produced by the rotation of the turbine blades generates a swishing sound as a result of the tip speed. The design of modern turbine blades reduces this aerodynamic noise by decreasing the rotational speeds of the blade tip or by using better blade pitch control in high winds. The aerodynamic sound emissions created by a wind turbine increases as the wind speed increases. However as the wind speed increases, the noise from the rotating turbines is usually masked by other background noise such as the movement of trees or if sited near an industrial or urban area. Turbine sound emissions will naturally decrease as the distance from the listener to the wind turbines increases. Wind turbines are tall vertical structures with long rotating blades that may represent a risk of collision to the birds which get too close. Most ornithologist agree that it is difficult to reach a definite conclusion about the impact that wind turbines have on bird mortality but most seem to agree that larger birds of prey are affected more. Bird collisions with turbine blades has been an issue for many years at some older wind farm sites due to poor siting, multi-bladed designs and open tower technology. Studies around the world has shown that bird fatalities may be as low as a few per turbine per year compared to the thousands that die each year from colliding with buildings, power lines, vehicles, etc. When put into context, the human impact on bird life from loss of habitat, industrialisation, over exploitation of their natural environment, hunting, pollution, etc. represents a far greater threat to the worlds bird population than collisions with turbine blades. Each year more and more bird species face extinction. The environmental impact of wind power on flora and fauna depends on the types of vegetation and animal life within the area of the turbines or wind farm. While there has been many studies around the world on the risk of impacts on birds, little has been done about the wildlife living beneath and around the wind farms and turbines. The local landscape, vegetation and habitat of many small animals and insects can be affected during the construction phase as access roads, cable ditches and foundations change the area. However, the construction process may take only a few weeks, depending on the site conditions and project size, but once complete, landscaping and agricultural activity can continue right up to the turbine bases. Then wind turbines may not make such an impact on the environment after all. Wind turbines are tall visible objects and as such have a visual impact on their surrounding landscape, like most other structures. But all is not bad bad either for wind power and the environment. Surveys and opinion polls have shown that public attitudes towards the installation of wind turbines around the countryside has shown consistent, strong support for this sustainable and renewable energy technology. Wind power is more popular now than ever before. The impact of wind power on the environment can be greatly reduced with proper planning, design and implementation. The environmental benefits of wind energy is clear as wind turbines create virtually no emissions during their continuous operation and also very little during their manufacture, installation, maintenance and final removal. The economic lifetime of a wind turbine may be at least 20 years, which can be prolonged by annual maintenance, but once de-commissioned and dismantled, the site could be restored back to its original state with most of the turbines components being recyclable. Wind energy is a clean and renewable energy source because the fuel (the wind) is free. So wind generated electrical energy should be used as much as possible to replace that generated from coal and gas. Then wind energy has a major role to play in opposing climate change by reducing the amount of CO2 emissions produced from conventional fossil fuel power generation. Around the world, hundreds of thousands of turbines have already been installed on available land, but as it becomes more difficult to find good open sites to erect more wind turbines planners are looking out to sea. Large offshore wind farms have already been developed as the wind resource offshore in the sea is far better than on land increasing power generation. However the installation cost are also much higher. While the visual and sound impacts or the availability of land may not be a problem offshore, the environmental affects on fish and other marine mammals can be a positive one. While the construction phase may disturb many of the fish species, the creation of new artificial habitats around the turbine bases have had significant effects on fish population. With a ban on shipping (other than maintenance ships) and fishing around the offshore turbines, local fish species have been able to develop. This availability of food may even attract new species of fish and subsequently marine mammals. As we have seen here that the impact of wind power and the environment can be positive or negative depending on your outlook. The energy output of a wind turbine over its operational life is far greater than the energy used to construct, operate and eventually dismantle the turbine. The visual impact of wind turbines on the environment is very specific to the particular site but on average the vast majority of the public are now in favour of wind energy showing a consistently high level of support. Clearly from an environmental point of view, the generation of energy using wind power is the best option. The environmental risks associated with climate change, greenhouse gases and the impact of acid rain on agriculture, forests, lakes and human health as a direct result of the combustion of fossil fuels is greatly decrease as more electricity is being generated by the wind. Planning permission has been granted by our local parish council to erect two large wind turbines in a field next to our village. They say it will power up to 60 homes but the village has a petition to stop it as the field can not be used afterwards as it will be fenced off.